For me, breakfast might just be the most exciting and delicious meal of the day. I feel terribly sorry for people who say they ‘hate breakfast’ or wake without an appetite. If this is the case for you, some work on your hydrochloric acid levels and nervous system will help bring that morning appetite back. For those who already enjoy a strong morning appetite, I have some health boosting breakfast alternatives that can get you the best start possible for your day. Many people want to increase the content of beautiful raw foods in their diet so of course the first thing I need to mention here is green smoothies! Green smoothies, first described by Vittoria Boutenko, contain a combination of leafy greens, fruit and water. These are blended well until there are no chunks or lumps, and then enjoyed. Many cafes and juice bars are now offering green smoothies on their menus, but the one you make at home will always be the healthiest. My general rule is 2 types of greens (kale, spinach, lettuce, dandelion greens, sprouts, chard, collard greens etc), 1-3 types of fruit (1/2 an apple or pear, a small orange, a small serve of berries, a frozen banana, ½ a mango, a small amount of papaya etc) and fresh filtered water. From this base you can add your own super boosts. A raw vegetarian protein powder such as pea, rice or hemp is a fantastic energy boost. Super greens such as spirulina, chlorella or barley grass help to alkalyse and increase iron. A super berry blend with acai, maqui, goji, blueberry etc add high potency antioxidants to your smoothie, or perhaps an essential fat component such as avocado, coconut oil, or hemp seed oil. Nuts, seeds and insoluble fibres such as psyllium husk or freshly ground flax seeds also give your smoothie a powerful boost. However you make it, if you start from the fruit, veg and water base, you can’t go wrong! If you have a green smoothie for breakfast, at least you know, no matter what else you eat that day, you have already had a huge raw nutrient hit. Chia pudding is another favourite raw breakkie we enjoy a lot on retreats. There is always a big bowl in the fridge ready for staff to enjoy whenever they need a yummy energy boost. Chia puddings are similar to green smoothies, once you have the core ingredients involved, you can pretty much do whatever you like! 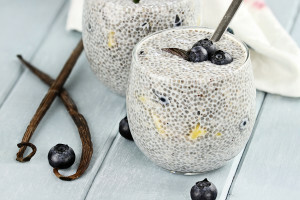 Chia puddings consist of chia seeds, water and a raw nut or seed milk. After that it’s up to you! You can mix in fruit, fruit juice, raw cacao, vanilla, sultanas, sweetener of choice, cinnamon, cacao nibs…. Whatever you like! We have 3 recipes available in our Wholefoods Masterclass Video Series for those who need some guidance. Poached eggs on sprouted grain toast (high in fibre, protein, energy producing and blood sugar regulating). Scrambled eggs with red onion, baby spinach and tomato. Eggs baked in a saucy baked bean mix. Avocado on toast, topped with a fried egg, finished with crumbled goats fetta, fresh sunflower sprouts and balsamic vinegar glaze. Another awesome and easy breakkie for veggos includes dairy products. While I am not a fan of cow dairy in general, goat, sheep and buffalo dairy is becoming widely available and provides a delicious alternative. How about a bowl of delicious fresh fruit, topped with a creamy dollop of sheep’s milk yoghurt (tastes the most like cow dairy), a generous sprinkle of granola and a drizzle of honey? Or perhaps some home made banana buckwheat pancakes with honey, cinnamon and quark (a cross between ricotta and cottage cheese). 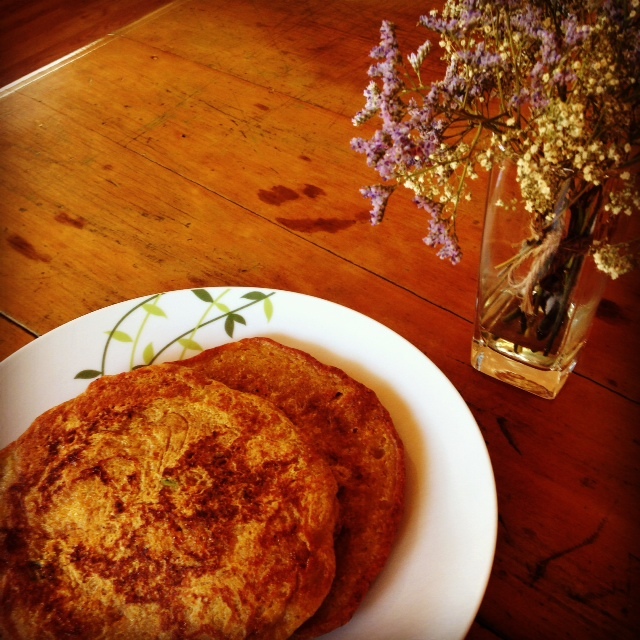 Buckwheat pancakes made without egg or milk, just with water or rice milk (makes then fluffier for some reason). Now again, this is a base. From here, go crazy! So far my experimentation has resulted in banana and cinnamon pancakes (slices of banana pressed into the cooking pancake), raw cacao, banana pancakes (add raw cacao to the mix before adding liquid), choc-raspberry pancakes, spiced apple pancakes (fennel, cardamom and cinnamon in the mix, thin slices of apple pressed into the cooking batter), carrot cake pancakes (finely grated carrot, sultanas, nutmeg, cinnamon, cardamom and ginger missed into the wet batter), and spiced pumpkin pancakes (cooked, mashed pumpkin with cinnamon, fennel and cardamom mixed into the batter). These are cooked in coconut oil and sweetened how you like. For a savoury option, why not try a vegan big breakfast with tofu scramble, wilted spinach, baked beans, roast tomatoes, asparagus, sautéed mushrooms… the list goes on! Many of your delicious mueslis, oats and granolas can be vegan simply by adding a nut milk, and a beautiful grainy bread, topped with babaganoush (eggplant spread) fresh tomato, and rocket can satisfy those looking for a tasty bite. For those with allergies, it is all about avoiding whatever the offending ingredient is. For me, I am reactive to wheat, dairy and eggs. This means I can enjoy all raw breakfasts, all wheat free vegan breakfasts, and then substituting other ingredients as need be. Here is a list of possible substitutes. Wheat- if you are only allergic to wheat (not gluten), try out spelt, oat, quinoa, rye, millet, buckwheat, coconut and rice, in breads, flours, grains and pancakes. Gluten- buckwheat, quinoa, millet, amaranth, coconut, rice and banana flours are on the market now. As are plenty of gluten free breads, pancake mixes and cereals. Dairy- as mentioned above, sheep, goat and buffalo dairy is becoming more available. You can also use coconut yoghurt, alternative milks, coconut oil as butter or nut cheeses. Eggs- use tofu is a scramble, some recipes work fine without eggs, and others may need you to make up an egg replacer (chia seeds can sometimes work- Google it!). There you have it! No reason to suffer through the same old boring breakfast! All these suggestions are healthy (yes even the choc-banana buckwheat pancakes! ), nutritious, filling and sustaining. For some suggested recipes for chia pudding, green smoothies as well as what to do with quiona, kale and avocado, why not check out the Wholefoods Masterclass Video Series. Thanks Bettina! Yes breakkie can certainly be the best meal of the day. Thank you so much for your comment. I love the variety of your breakfasts! Having a truly savoury breakfast, such as miso, veggies and omelet, is something many Australians struggle with, as we are just not used to eating this way. But it can be incredibly healthy! Many cultures including Indian and Japanese focus on savoury breakfasts, and many Western countries could improve their health simply by taking the sweet out of breakfast and avoiding high sugar cereals, drinks and baked goods. Now in regards to your question- I believe in a healthy functioning digestive system, there should be no need to stress over food combining. Some food, such as melons, can cause indigestion when eaten with any other foods, so should probably be eaten alone if this occurs. But if fruits and vegetables don’t combine well in a green smoothie for you, this points to some work needing to be done on the digestive system. If the digestion is healthy, there should be no need for rules about food combining. I came across your website while researching Hashimoto’s. Your breakfast ideas are inspiring but I just wanted to check with you about whether it would be okay for me to have green juices/smoothies and tofu (love the idea of scrambled tofu)? Some web sites are against people with thyroid problems using these products in their diets.